JACKSON, Ohio — Lucky number 13 clinched nifty number 19. That’s because the Meigs High School boys golf squad, once again, is the Tri-Valley Conference Ohio Division champion — having locked up the 2017 title on Monday at Franklin Valley Golf Course. In the sixth and next-to-last league match of the season, the Marauders captured a narrow four-stroke victory over runner-up Athens 190-194. As a result, Meigs managed its 13 consecutive TVC Ohio victory, and also secured its second straight outright championship and its fifth division crown in the past six years. With the win, the Marauders are now a perfect 36-0 in league play — and can go 42-0 for the second year in a row with a win at Athens in the league finale. The Bulldogs, which are now 28-8, can no longer overtake the Marauders in any single scenario for the final affair. 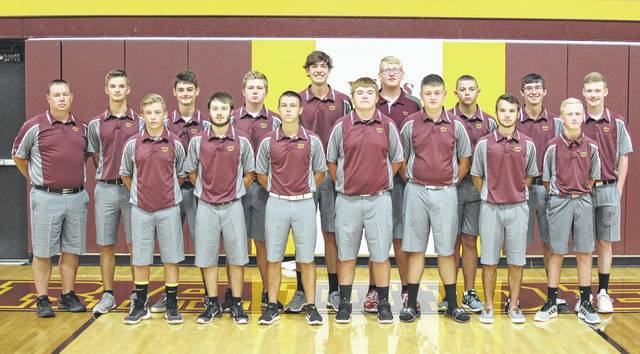 While the four-stroke win was one of Meigs’ closer matches this season, it did land the Maroon and Gold its 19th TVC golf championship in school history. Of those 19 titles, 16 are now outright with three shares —in 2015 with Vinton County, 2012 with Athens and Alexander, and in 2000 with Belpre. In addition to 2013, 2016 and now 2017, the Marauders’ other outright championships came in 1983 and 1984, 1990 thru 1997, and in 2005 thru 2007. On Monday, while Athens’ four counting scores were a pair of 44s and a pair of 53s, Meigs mustered a low-round 41 — followed by a 45, a 51 and a 53. Alexander, now 19-17 for fourth, ended up third by shooting a 212. Vinton County — the host school for the match — and Wellston — which shares Franklin Valley as its home course with Vinton County — both shot a team total of 213. The Vikings took fourth and Wellston fifth, however, thanks to VCHS winning the fifth-score tiebreaker. The Vikings remain third in the standings at 25-11, while Wellston sits fifth at 12-24. River Valley, which has placed sixth in all six matches to stand at 6-30, had a team score of 233. Nelsonville-York, which fielded just two golfers and thus did not post a team score, remains winless at 0-36. Only Wellston, with five players, was the only other team to not field a full club of six. The Marauders were paced, once again, by senior Levi Chapman —who claimed match medalist honors for the fifth time this year. The defending TVC Ohio Player of Year fired a 4-over par 41, as the schools took aim at the famed Franklin Valley back nine. Wyatt Nicholson notched a 45, while Bobby Musser shot a 51 and Brayden Ervin added a 53 for the Marauders’ other counting cards. Their two non-counting scores were a pair of 56s by Bryce Swatzel and Caleb Stanley. Athens’ two 44s were by Drew Zorn and Preston Hayes, while Owen Campitelli and Ben Pratt posted the 53s. Sam Carpenter and Greg List lauded 55s for the Bulldogs. Andrew Vogt paced Alexander with a 49, followed by Whit Byrd with a 52, Matt Morris with a 55 and Logan Colburn and T.J. Vogt with a pair of 56s. Vinton County’s top four scores were by Noah Waddell (49), Cameron Hamon (52), Bailey Bartoe (55) and Shawn McCarty (57), while Wellston’s top four cards came from Hunter Cardwell (49), Brandyn Bush (49), Timothy Stanley (57) and Brice Sizemore (58). For the tiebreaker, Brock Hamon had a 60 for the Vikings, while Wellston’s Jacob Sheaffer shot a 65. River Valley’s Aaron Burke, by boasting a 42, not only paced the Raiders but was also the match medalist runner-up. The Raiders’ remaining scores were a 55 by Gabe Gilmore, a 66 by Tyler Roberts, a 70 by Chloe Gee, a 71 by Hayley Cox and a 73 by Elayna Canizares. Clay Hall had a 62 and Caitlyn Hall a 72 for Nelsonville-York’s only scores. The final TVC Ohio golf match will take place on Monday at Athens Country Club. Pictued above are members of the 2017 Meigs boys golf team. Standing in the front row, from left, are Bailey Jones, Theo McElroy, Levi Chapman, Wyatt Nicholson, Brayden Ervin, Brody Reynolds and Griffin Buck. Standing in the back row are head coach Tom Cremeans, Bryce Swatzel, Cole Arnott, Austin Mahr, Bobby Musser, Dawson Justice, Gus Kennedy, Caleb Stanley and Trenton Peacock.